Sydney comedian Jennifer Wong is once again gracing the Melbourne International Comedy Festival following last year’s sell out season. With a lovable awkwardness and subtly yet hilariously delivered one-liners, Wong is both funny and relatable. Her shows cover everything from her mother choking on a fishbone, to being introverted and ‘bookish’, to spot-on observations about how non-Chinese Australians view ‘Chinese-ness’. 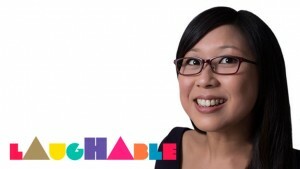 This year’s show, Laughable: The One-Liner Show, is showing at the Melbourne International Comedy Festival from 27 March – 20th April, 2014. Comedian. I like words where each letter is only used once. I’ve never felt like a comedienne. When I see the word, I picture a tiny comedian, julienned carrot-style. But I respect other people’s decisions to julienne carrots. And identify as comediennes. How does a self-proclaimed introvert get into stand-up comedy? Comedy is great for introverts. You spend most of your time writing alone. Then finally when you’re in public (for an absolute and set amount of time, with plenty of space between you and others, i.e. the audience), you say out loud the words you’ve carefully prepared to people who mostly aren’t allowed to talk back. You’re in control. They laugh at you. And then you leave. It’s great. Did I just describe a megalomaniac, or an introvert? Hmm. I love the thinking alone part of what I do, and I love performing, too. Many of the comedians I know would call themselves introverts. Or introverttes. As a comedian, how do you think your particular life-experiences have influenced your work? I guess I had a lot of time to observe others from a young age through the thick lenses of my glasses while teeth grew from strange parts of my gums and I tried to hide the severe eczema on my face with what little hair was available in a haircut for boys, as one of the only kids at school who was Chinese, asthmatic, flat-footed, and highly allergic to grass. Who’s allergic to grass, for god’s sake? That, or the fact that I was always trying to keep up with my older, funny cousins, one of whom gave me the book Seinlanguage by Seinfeld when it was first published. As its name would suggest, this year’s show, Laughable: The One-Liner Show, is based on one-liners. Off the top of your head, can you think of a one-liner about Lip? I can’t think of a one-liner about Lip off the top of my head. But I can between my nose and my chin. What else can we expect from your show? Lots of jokes, jokes about jokes, and audience interaction (introvert style). Yes, I do. Rights, access, and opportunity. Strength in numbers, and literacy. Audiences react differently to every performer. Go to an open mic or a showcase night, and feel the room change with each new person onstage who’s different to the previous performer. At a typical gig, I really think the performer’s style, energy, and attitude are the defining qualities for how an audience reacts. In fact, go to Upfront, a comedy gala of female comedians at the Melbourne International Comedy Festival, and see how the audience reacts to a range of female performers. 1. Always try to avoid answering this question in a Q&A. It’s too hard. 3. Gig a lot…it’s the only way you’ll get better. 4. Don’t lose touch with the real world. 5. Find buddies and mentors. And come to Jeez Louise panel and workshops at the Melbourne International Comedy Festival, where you’ll be able to do some of those things and meet some friendly, experienced performers. Apart from my show, Jeez Louise, and Upfront, I’ll also be playing two characters in Miss Itchy’s Late Night Larvae. This entry was posted in Arts, Comedy, Theatre and tagged comedian, Jennifer Wong, melbourne, melbourne international comedy festival, MICF 2014, q&a. Bookmark the permalink.